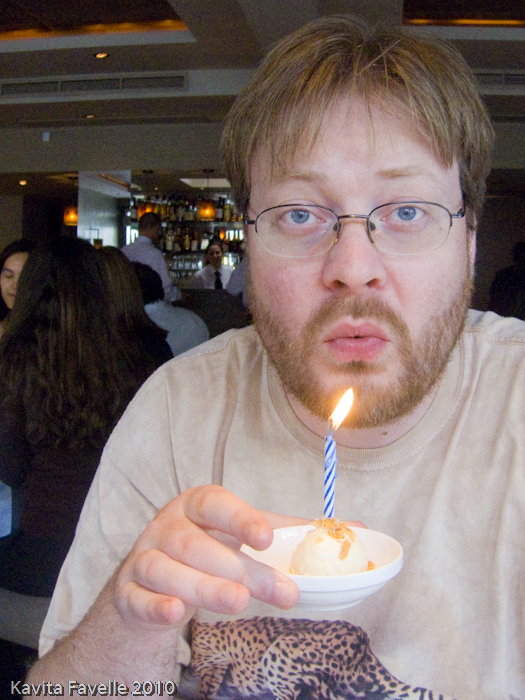 Waaaay back in May it was Pete’s birthday. He’s entered his 40th year (ok, technically it was only his 39th birthday) so a little celebration was in order. Thanks to a tip off, I learned about the brewery tours at Fuller’s, over in Chiswick and secretly booked us into their morning tour. Looking for suitable lunch options in the vicinity I realised that La Trompette, where we’d previously enjoyed a rather fabulous meal, was just in the right place so I booked us a table. And I actually managed to keep both destinations and bookings a secret, too! After the brewery tour, which ended with a tasting session of the brewery’s beers, including their various special bottled beers, we stopped to buy a few bottles in the brewery shop before walking across to La Trompette. 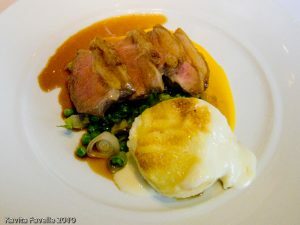 At just £19.50 for 2 courses, £23.50 for 3, lunch at this Michelin starred restaurant is a pretty good deal. We were seated by the window, given menus and offered water – no snobbiness here about asking for iced tap, which was replenished regularly without having to ask. The bread basket was proffered and, remembering the walnut raisin bread from before, I chose the same again. Pete went for for one of the other choices, I forget which, but agreed it was rather good. Such fantastic bread that, knowing a three course meal was to come, I could not help myself from asking for more… twice! Both of us opted for the same starter – the foie gras and chicken liver parfait with fig chutney, cornichons and toasted brioche. A generous portion served in individual pots, the parfait was as rich in flavour and light in texture as we’d remembered from our previous visit and perfectly balanced by the sweet chutney and the sharp pickles. And I have a bit of a thing about brioche! Pete enjoyed his slow cooked veal with risotto alla Milanese, celery and gremolata well enough. The veal was deeply meaty in taste and rendered spoonably soft by the slow cooking. 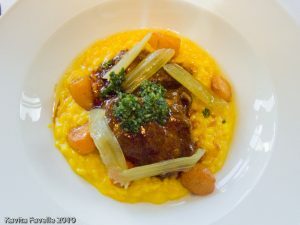 The risotto was rich – too rich for me but then I find too much saffron slightly suffocating, like I’ve been kidnapped and had a musty old bag tied over my head. (No, I don’t have any asphyxiation fantasies!) “Good not great”, was the verdict. My roast saddle of new season lamb, gratin dauphinoise, petit pois à la française also failed to reach greatness. The vegetables were the highlight – the dauphinoise was luscious without being overly creamy; the peas, which were mixed with cabbage and leeks, were the very essence of spring. Sadly, the lamb itself was seriously lacking in flavour and rather too flaccid – tender is all well and good but, when there’s a thick layer of fat, I expect that to be crispy, at least on the outer edge. Given how easy it is to source top quality meat in the UK, I was disappointed that the star ingredient of this dish just didn’t deliver. It wasn’t until I read my review of our last visit that I realised Pete ordered almost exactly the same dessert again – the panna cotta with Yorkshire rhubarb compote and vanilla sugar beignets simply substituted doughnuts for biscotti. Lacking the rhubarb foam that had surprised and enchanted Pete and my sister last time, this was still a very tasty dessert judging from the noises and smiles of contentment. 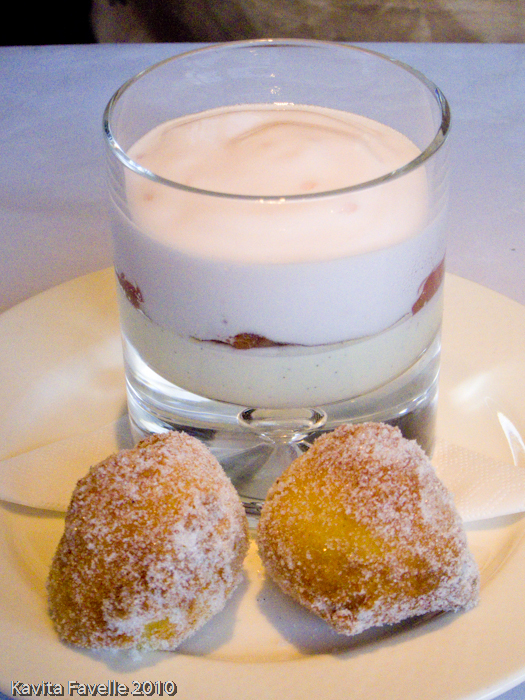 The hot doughnuts went down well though personally I’m not sure they made a great match with the panna cotta – Pete is a doughnut fiend and would happily eat freshly made doughnuts with anything! 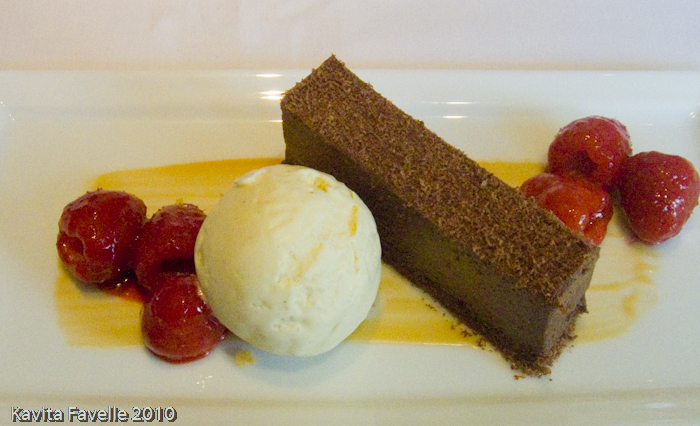 My Valrhona chocolate marquise with vanilla ice-cream and glazed raspberries was delicious. The dense slab of chocolate was extremely rich indeed and the tart raspberries helped cut through it very well. 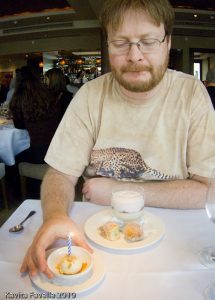 For me, the ice-cream was rather so-so, lacking any intensity of flavour and not as creamy in texture as I expected either. The marquise sat on a thin layer of crunchy praline, which was delightful – a thicker layer or another running through the middle would have been very welcome. Although he’d already been spoiled rotten by a most wonderful black forest birthday gateaux at Bob Bob Ricard just a couple of days earlier, I figured that there ought to be a candle on the day itself too, and one was delivered tucked into a scoop of ice-cream, just after the main desserts. As a well-priced and tasty lunch, well located for our brewery tour, La Trompette delivered. But I can’t help but thinking that our experience didn’t quite live up to the memories of our previous meal just 15 months earlier. 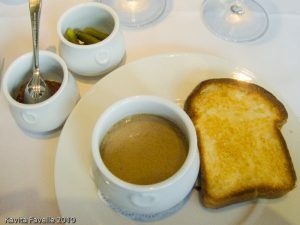 Service was still very good, though we didn’t feel quite as cosseted as before – perhaps that’s a function of our lunch time visit whereas our previous was for dinner. The food didn’t blow us away either. The pre-prepared starters and desserts outshone the mains by quite some distance, making me wonder if a less-experienced chef was in charge of the kitchen during the lunch service. I’d say that the average of all three courses was good rather than great. Good food and great value, but not quite as obvious a recipient of that michelin star as I thought last time. 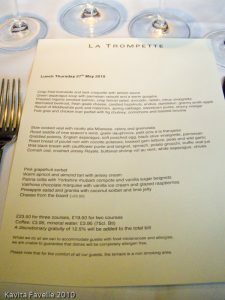 5 Comments to "Trumpeting a little less loudly… La Trompette"
Excellent value set lunch menu at £23.5 for 3 courses – the food looks well executed. I don't know that part of London at all, but will bear this place in mind if I get to be heading that way. Happy Birthday Pete! have forgotten about La Trompette. I like a good lunch deal. Will have to add that to the list. Luiz, it's a really good deal and the food is pretty good. Follow the link in the review to read about our previous meal, which for me was even better. But I don't think you'd be disappointed with La Trompette – old school service and very reasonable prices too. May, it's a great lunch deal. For me, normally, it's not a handy location, unless we're visiting my sister who works near there, or as in this case, the nearby brewery. Su-Lin, I can't quite decide… but certainly if I go again it will be for an evening.